Newton, Sir Isaac (1642-1727), English natural philosopher, generally regarded as the most original and influential theorist in the history of science. In addition to his invention of the infinitesimal calculus and a new theory of light and color, Newton transformed the structure of physical science with his three laws of motion and the law of universal gravitation. As the keystone of the scientific revolution of the 17th century, Newton's work combined the contributions of Copernicus, Kepler, Galileo, Descartes, and others into a new and powerful synthesis. Three centuries later the resulting structure - classical mechanics - continues to be a useful but no less elegant monument to his genius. Life & Character - Isaac Newton was born prematurely on Christmas day 1642 (4 January 1643, New Style) in Woolsthorpe, a hamlet near Grantham in Lincolnshire. The posthumous son of an illiterate yeoman (also named Isaac), the fatherless infant was small enough at birth to fit 'into a quartpot.' When he was barely three years old Newton's mother, Hanna (Ayscough), placed her first born with his grandmother in order to remarry and raise a second family with Barnabas Smith, a wealthy rector from nearby North Witham. Much has been made of Newton's posthumous birth, his prolonged separation from his mother, and his unrivaled hatred of his stepfather. Until Hanna returned to Woolsthorpe in 1653 after the death of her second husband, Newton was denied his mother's attention, a possible clue to his complex character. Newton's childhood was anything but happy, and throughout his life he verged on emotional collapse, occasionally falling into violent and vindictive attacks against friend and foe alike. With his mother's return to Woolsthorpe in 1653, Newton was taken from school to fulfill his birthright as a farmer. Happily, he failed in this calling, and returned to King's School at Grantham to prepare for entrance to Trinity College, Cambridge. Numerous anecdotes survive from this period about Newton's absent-mindedness as a fledging farmer and his lackluster performance as a student. But the turning point in Newton's life came in June 1661 when he left Woolsthorpe for Cambridge University. Here Newton entered a new world, one he could eventually call his own. Although Cambridge was an outstanding center of learning, the spirit of the scientific revolution had yet to penetrate its ancient and somewhat ossified curriculum. Little is known of Newton's formal studies as an undergraduate, but he likely received large doses of Aristotle as well as other classical authors. And by all appearances his academic performance was undistinguished. In 1664 Isaac Barrow, Lucasian Professor of Mathematics at Cambridge, examined Newton's understanding of Euclid and found it sorely lacking. We now know that during his undergraduate years Newton was deeply engrossed in private study, that he privately mastered the works of René Descartes, Pierre Gassendi, Thomas Hobbes, and other major figures of the scientific revolution. A series of extant notebooks shows that by 1664 Newton had begun to master Descartes' Géométrie and other forms of mathematics far in advance of Euclid's Elements. Barrow, himself a gifted mathematician, had yet to appreciate Newton's genius. In 1665 Newton took his bachelor's degree at Cambridge without honors or distinction. Since the university was closed for the next two years because of plague, Newton returned to Woolsthorpe in midyear. There, in the following 18 months, he made a series of original contributions to science. As he later recalled, 'All this was in the two plague years of 1665 and 1666, for in those days I was in my prime of age for invention, and minded mathematics and philosophy more than at any time since.' In mathematics Newton conceived his 'method of fluxions' (infinitesimal calculus), laid the foundations for his theory of light and color, and achieved significant insight into the problem of planetary motion, insights that eventually led to the publication of his Principia (1687). In April 1667, Newton returned to Cambridge and, against stiff odds, was elected a minor fellow at Trinity. Success followed good fortune. In the next year he became a senior fellow upon taking his master of arts degree, and in 1669, before he had reached his 27th birthday, he succeeded Isaac Barrow as Lucasian Professor of Mathematics. The duties of this appointment offered Newton the opportunity to organize the results of his earlier optical researches, and in 1672, shortly after his election to the Royal Society, he communicated his first public paper, a brilliant but no less controversial study on the nature of color. In the first of a series of bitter disputes, Newton locked horns with the society's celebrated curator of experiments, the bright but brittle Robert Hooke. The ensuing controversy, which continued until 1678, established a pattern in Newton's behavior. After an initial skirmish, he quietly retreated. Nonetheless, in 1675 Newton ventured another yet another paper, which again drew lightning, this time charged with claims that he had plagiarized from Hooke. The charges were entirely ungrounded. Twice burned, Newton withdrew. In 1678, Newton suffered a serious emotional breakdown, and in the following year his mother died. Newton's response was to cut off contact with others and engross himself in alchemical research. These studies, once an embarrassment to Newton scholars, were not misguided musings but rigorous investigations into the hidden forces of nature. Newton's alchemical studies opened theoretical avenues not found in the mechanical philosophy, the world view that sustained his early work. While the mechanical philosophy reduced all phenomena to the impact of matter in motion, the alchemical tradition upheld the possibility of attraction and repulsion at the particulate level. Newton's later insights in celestial mechanics can be traced in part to his alchemical interests. By combining action-at-a-distance and mathematics, Newton transformed the mechanical philosophy by adding a mysterious but no less measurable quantity, gravitational force. In 1666, as tradition has it, Newton observed the fall of an apple in his garden at Woolsthorpe, later recalling, 'In the same year I began to think of gravity extending to the orb of the Moon.' Newton's memory was not accurate. In fact, all evidence suggests that the concept of universal gravitation did not spring full-blown from Newton's head in 1666 but was nearly 20 years in gestation. Ironically, Robert Hooke helped give it life. In November 1679, Hooke initiated an exchange of letters that bore on the question of planetary motion. Although Newton hastily broke off the correspondence, Hooke's letters provided a conceptual link between central attraction and a force falling off with the square of distance. Sometime in early 1680, Newton appears to have quietly drawn his own conclusions. Meanwhile, in the coffeehouses of London, Hooke, Edmund Halley, and Christopher Wren struggled unsuccessfully with the problem of planetary motion. Finally, in August 1684, Halley paid a legendary visit to Newton in Cambridge, hoping for an answer to his riddle: What type of curve does a planet describe in its orbit around the sun, assuming an inverse square law of attraction? When Halley posed the question, Newton's ready response was 'an ellipse.' When asked how he knew it was an ellipse Newton replied that he had already calculated it. Although Newton had privately answered one of the riddles of the universe--and he alone possessed the mathematical ability to do so--he had characteristically misplaced the calculation. After further discussion he promised to send Halley a fresh calculation forthwith. In partial fulfillment of his promise Newton produced his De Motu of 1684. From that seed, after nearly two years of intense labor, the Philosophiae Naturalis Principia Mathematica appeared. Arguably, it is the most important book published in the history of science. But if the Principia was Newton's brainchild, Hooke and Halley were nothing less than midwives. Although the Principia was well received, its future was cast in doubt before it appeared. Here again Hooke was center stage, this time claiming (not without justification) that his letters of 1679-1680 earned him a role in Newton's discovery. But to no effect. Newton was so furious with Hooke that he threatened to suppress Book III of the Principia altogether, finally denouncing science as 'an impertinently litigious lady.' Newton calmed down and finally consented to publication. But instead of acknowledging Hooke's contribution Newton systematically deleted every possible mention of Hooke's name. Newton's hatred for Hooke was consumptive. Indeed, Newton later withheld publication of his Opticks (1704) and virtually withdrew from the Royal Society until Hooke's death in 1703. After publishing the Principia, Newton became more involved in public affairs. In 1689 he was elected to represent Cambridge in Parliament, and during his stay in London he became acquainted with John Locke, the famous philosopher, and Nicolas Fatio de Duillier, a brilliant young mathematician who became an intimate friend. In 1693, however, Newton suffered a severe nervous disorder, not unlike his breakdown of 1677-1678. The cause is open to interpretation: overwork; the stress of controversy; the unexplained loss of friendship with Fatio; or perhaps chronic mercury poisoning, the result of nearly three decades of alchemical research. Each factor may have played a role. We only know Locke and Samuel Pepys received strange and seemingly deranged letters that prompted concern for Newton's 'discomposure in head, or mind, or both.' Whatever the cause, shortly after his recovery Newton sought a new position in London. In 1696, with the help of Charles Montague, a fellow of Trinity and later earl of Halifax, Newton was appointed Warden and then Master of the Mint. His new position proved 'most proper,' and he left Cambridge for London without regret. 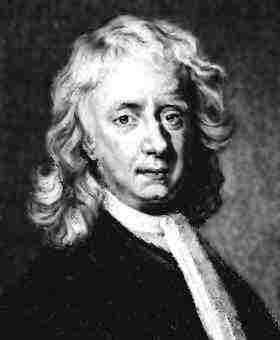 During his London years Newton enjoyed power and worldly success. His position at the Mint assured a comfortable social and economic status, and he was an active and able administrator. After the death of Hooke in 1703, Newton was elected president of the Royal Society and was annually reelected until his death. In 1704 he published his second major work, the Opticks, based largely on work completed decades before. He was knighted in 1705. Although his creative years had passed, Newton continued to exercise a profound influence on the development of science. In effect, the Royal Society was Newton's instrument, and he played it to his personal advantage. His tenure as president has been described as tyrannical and autocratic, and his control over the lives and careers of younger disciples was all but absolute. Newton could not abide contradiction or controversy - his quarrels with Hooke provide singular examples. But in later disputes, as president of the Royal Society, Newton marshaled all the forces at his command. For example, he published Flamsteed's astronomical observations - the labor of a lifetime - without the author's permission; and in his priority dispute with Leibniz concerning the calculus, Newton enlisted younger men to fight his war of words, while behind the lines he secretly directed charge and countercharge. In the end, the actions of the Society were little more than extensions of Newton's will, and until his death he dominated the landscape of science without rival. He died in London on March 20, 1727 (March 31, New Style). Mathematics - The origin of Newton's interest in mathematics can be traced to his undergraduate days at Cambridge. Here Newton became acquainted with a number of contemporary works, including an edition of Descartes Géométrie, John Wallis' Arithmetica infinitorum, and other works by prominent mathematicians. But between 1664 and his return to Cambridge after the plague, Newton made fundamental contributions to analytic geometry, algebra, and calculus. Specifically, he discovered the binomial theorem, new methods for expansion of infinite series, and his 'direct and inverse method of fluxions.' As the term implies, fluxional calculus is a method for treating changing or flowing quantities. Hence, a 'fluxion' represents the rate of change of a 'fluent'--a continuously changing or flowing quantity, such as distance, area, or length. In essence, fluxions were the first words in a new language of physics. Newton's creative years in mathematics extended from 1664 to roughly the spring of 1696. Although his predecessors had anticipated various elements of the calculus, Newton generalized and integrated these insights while developing new and more rigorous methods. The essential elements of his thought were presented in three tracts, the first appearing in a privately circulated treatise, De analysi (On Analysis),which went unpublished until 1711. In 1671, Newton developed a more complete account of his method of infinitesimals, which appeared nine years after his death as Methodus fluxionum et serierum infinitarum (The Method of Fluxions and Infinite Series, 1736). In addition to these works, Newton wrote four smaller tracts, two of which were appended to his Opticks of 1704. Newton and Leibniz. Next to its brilliance, the most characteristic feature of Newton's mathematical career was delayed publication. Newton's priority dispute with Leibniz is a celebrated but unhappy example. Gottfried Wilhelm Leibniz, Newton's most capable adversary, began publishing papers on calculus in 1684, almost 20 years after Newton's discoveries commenced. The result of this temporal discrepancy was a bitter dispute that raged for nearly two decades. The ordeal began with rumors that Leibniz had borrowed ideas from Newton and rushed them into print. It ended with charges of dishonesty and outright plagiarism. The Newton-Leibniz priority dispute--which eventually extended into philosophical areas concerning the nature of God and the universe--ultimately turned on the ambiguity of priority. It is now generally agreed that Newton and Leibniz each developed the calculus independently, and hence they are considered co-discoverers. But while Newton was the first to conceive and develop his method of fluxions, Leibniz was the first to publish his independent results. Optics. Newton's optical research, like his mathematical investigations, began during his undergraduate years at Cambridge. But unlike his mathematical work, Newton's studies in optics quickly became public. Shortly after his election to the Royal Society in 1671, Newton published his first paper in the Philosophical Transactions of the Royal Society. This paper, and others that followed, drew on his undergraduate researches as well as his Lucasian lectures at Cambridge. The Crucial Experiment. Newton's most famous experiment, the experimentum crucis, demonstrated his theory of the composition of light. Briefly, in a dark room Newton allowed a narrow beam of sunlight to pass from a small hole in a window shutter through a prism, thus breaking the white light into an oblong spectrum on a board. Then, through a small aperture in the board, Newton selected a given color (for example, red) to pass through yet another aperture to a second prism, through which it was refracted onto a second board. What began as ordinary white light was thus dispersed through two prisms. Newton probably conducted a number of his prism experiments at Cambridge before the plague forced him to return to Woolsthorpe. His Lucasian lectures, later published in part as Optical Lectures (1728), supplement other researches published in the Society's Transactions dating from February 1672. The Opticks. The Opticks of 1704, which first appeared in English, is Newton's most comprehensive and readily accessible work on light and color. In Newton's words, the purpose of the Opticks was 'not to explain the Properties of Light by Hypotheses, but to propose and prove them by Reason and Experiments.' Divided into three books, the Opticks moves from definitions, axioms, propositions, and theorems to proof by experiment. A subtle blend of mathematical reasoning and careful observation, the Opticks became the model for experimental physics in the 18th century. The Corpuscular Theory. But the Opticks contained more than experimental results. During the 17th century it was widely held that light, like sound, consisted of a wave or undulatory motion, and Newton's major critics in the field of optics--Robert Hooke and Christiaan Huygens--were articulate spokesmen for this theory. But Newton disagreed. Although his views evolved over time, Newton's theory of light was essentially corpuscular, or particulate. In effect, since light (unlike sound) travels in straight lines and casts a sharp shadow, Newton suggested that light was composed of discrete particles moving in straight lines in the manner of inertial bodies. Further, since experiment had shown that the properties of the separate colors of light were constant and unchanging, so too, Newton reasoned, was the stuff of light itself-- particles. At various points in his career Newton in effect combined the particle and wave theories of light. In his earliest dispute with Hooke and again in his Opticks of 1717, Newton considered the possibility of an ethereal substance--an all-pervasive elastic material more subtle than air--that would provide a medium for the propagation of waves or vibrations. From the outset Newton rejected the basic wave models of Hooke and Huygens, perhaps because they overlooked the subtlety of periodicity. The question of periodicity arose with the phenomenon known as 'Newton's rings.' In book II of the Opticks, Newton describes a series of experiments concerning the colors of thin films. His most remarkable observation was that light passing through a convex lens pressed against a flat glass plate produces concentric colored rings (Newton's rings) with alternating dark rings. Newton attempted to explain this phenomenon by employing the particle theory in conjunction with his hypothesis of 'fits of easy transmission [refraction] and reflection.' After making careful measurements, Newton found that the thickness of the film of air between the lens (of a given curvature) and the glass corresponded to the spacing of the rings. If dark rings occurred at thicknesses of 0, 2, 4, 6... , then the colored rings corresponded to an odd number progression, 1, 3, 5, 7, .... Although Newton did not speculate on the cause of this periodicity, his initial association of 'Newton's rings' with vibrations in a medium suggests his willingness to modify but not abandon the particle theory. The Opticks was Newton's most widely read work. Following the first edition, Latin versions appeared in 1706 and 1719, and second and third English editions in 1717 and 1721. Perhaps the most provocative part of the Opticks is the section known as the 'Queries,' which Newton placed at the end of the book. Here he posed questions and ventured opinions on the nature of light, matter, and the forces of nature. While the myth of Newton and the apple maybe true, the traditional account of Newton and gravity is not. To be sure, Newton's early thoughts on gravity began in Woolsthorpe, but at the time of his famous 'moon test' Newton had yet to arrive at the concept of gravitational attraction. Early manuscripts suggest that in the mid-1660's, Newton did not think in terms of the moon's central attraction toward the earth but rather of the moon's centrifugal tendency to recede. Under the influence of the mechanical philosophy, Newton had yet to consider the possibility of action- at-a-distance; nor was he aware of Kepler's first two planetary hypotheses. For historical, philosophical, and mathematical reasons, Newton assumed the moon's centrifugal 'endeavour' to be equal and opposite to some unknown mechanical constraint. For the same reasons, he also assumed a circular orbit and an inverse square relation. The latter was derived from Kepler's third hypothesis (the square of a planet's orbital period is proportional to the cube of its mean distance from the sun), the formula for centrifugal force (the centrifugal force on a revolving body is proportional to the square of its velocity and inversely proportional to the radius of its orbit), and the assumption of circular orbits. The next step was to test the inverse square relation against empirical data. To do this Newton, in effect, compared the restraint on the moon's 'endeavour' to recede with the observed rate of acceleration of falling objects on earth. The problem was to obtain accurate data. Assuming Galileo's estimate that the moon is 60 earth radii from the earth, the restraint on the moon should have been 1/3600 (1/602) of the gravitational acceleration on earth. But Newton's estimate of the size of the earth was too low, and his calculation showed the effect on the moon to be about 1/4000 of that on earth. As Newton later described it, the moon test answered 'pretty nearly.' But the figures for the moon were not exact, and Newton abandoned the problem. In late 1679 and early 1680 an exchange of letters with Hooke renewed Newton's interest. In November 1679, nearly 15 years after the moon test, Hooke wrote Newton concerning a hypothesis presented in his Attempt to Prove the Motion of the Earth (1674). Here Hooke proposed that planetary orbits result from a tangential motion and 'an attractive motion towards the centrall body.' In later letters Hooke further specified a central attracting force that fell off with the square of distance. As a result of this exchange Newton rejected his earlier notion of centrifugal tendencies in favor of central attraction. Hooke's letters provided crucial insight. But in retrospect, if Hooke's intuitive power seems unparalleled, it never approached Newton's mathematical power in principle or in practice. When Halley visited Cambridge in 1684, Newton had already demonstrated the relation between an inverse square attraction and elliptical orbits. To Halley's 'joy and amazement,' Newton apparently succeeded where he and others failed. With this, Halley's role shifted, and he proceeded to guide Newton toward publication. Halley personally financed the Principia and saw it through the press to publication in July 1687. The Principia. Newton's masterpiece is divided into three books. Book I of the Principia begins with eight definitions and three axioms, the latter now known as Newton's laws of motion. No discussion of Newton would be complete without them: (1) Every body continues in its state of rest, or uniform motion in a straight line, unless it is compelled to change that state by forces impressed on it (inertia). (2) The change in motion is proportional to the motive force impressed and is made in the direction of the straight line in which that force is impressed (F = ma). (3) To every action there is always an opposed and equal reaction. Following these axioms, Newton proceeds step by step with propositions, theorems, and problems. In Book III, subtitled the System of the World, Newton extended his three laws of motion to the frame of the world, finally demonstrating 'that there is a power of gravity tending to all bodies, proportional to the several quantities of matter which they contain.' Newton's law of universal gravitation states that F = G Mm/R2; that is, that all matter is mutually attracted with a force (F) proportional to the product of their masses (Mm) and inversely proportional to the square of distance (R2) between them. G is a constant whose value depends on the units used for mass and distance. To demonstrate the power of his theory, Newton used gravitational attraction to explain the motion of the planets and their moons, the precession of equinoxes, the action of the tides, and the motion of comets. In sum, Newton's universe united heaven and earth with a single set of laws. It became the physical and intellectual foundation of the modern world view. Perhaps the most powerful and influential scientific treatise ever published, the Principia appeared in two further editions during Newton's lifetime, in 1713 and 1726. Other Researches. Throughout his career Newton conducted research in theology and history with the same passion that he pursued alchemy and science. Although some historians have neglected Newton's nonscientific writings, there is little doubt of his devotion to these subjects, as his manuscripts amply attest. Newton's writings on theological and biblical subjects alone amount to about 1.3 million words, the equivalent of 20 of today's standard length books. Although these writings say little about Newtonian science, they tell us a good deal about Isaac Newton. Newton's final gesture before death was to refuse the sacrament, a decision of some consequence in the 18th century. Although Newton was dutifully raised in the Protestant tradition his mature views on theology were neither Protestant, traditional, nor orthodox. In the privacy of his thoughts and writings, Newton rejected a host of doctrines he considered mystical, irrational, or superstitious. In a word, he was a Unitarian. Newton's research outside of science--in theology, prophecy, and history--was a quest for coherence and unity. His passion was to unite knowledge and belief, to reconcile the Book of Nature with the Book of Scripture. But for all the elegance of his thought and the boldness of his quest, the riddle of Isaac Newton remained. In the end, Newton is as much an enigma to us as he was, no doubt, to himself.